This Sunday, 23rd August, will be the final day of Manx National Heritage’s highly successful temporary exhibition ‘Pirates of the Irish Sea’ at the House of Manannan in Peel. 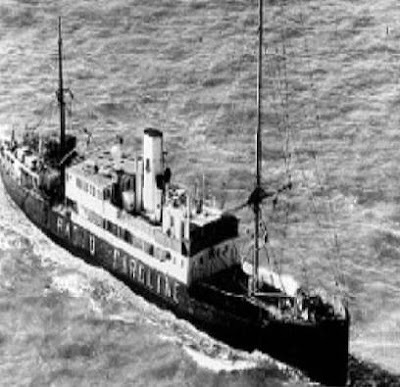 Offshore station Radio Caroline North broadcast from the MV Caroline (formerly the MV Fredericia), anchored off Ramsey, between 1964 and 1968, and broke new ground in British broadcasting history. The exhibition, which celebrates the phenomenon of Radio Caroline North forty years after it left Manx waters, has been running for just over a year and has proved very popular with visitors. To mark the end of the exhibition, former Caroline DJ Alan Turner has organised a special reunion of former DJs and engineers who will gather at the House of Manannan on Sunday. Among those attending will be DJ Tony Prince, who went on to broadcast on Radio Luxemburg. Exhibition curator Matthew Richardson comments, “The story of Radio Caroline North was one of the most significant chapters in Manx post-war history. "The station was a real icon of the swinging sixties, when young people decided they no longer wanted to listen to what they were told they should by the establishment, and decided instead they wanted their own kind of music. "It was revolutionary, and it all happened right here in the Isle of Man.” Alan Turner worked for Radio Caroline when the ship was still anchored off the Suffolk Coast in 1964. He then stayed on when it sailed to the Island and broadcast as Radio Caroline North. The exhibition was opened by Terry Cringle, who as a young Manx freelance journalist reported on Radio Caroline for the major British newspapers. It features the memories of those who worked on the station and also some of the people whose lives were touched by the music which it broadcast. The Caroline memorabilia on show also includes the famous Caroline bell. Last September the exhibition was visited by Caroline founder, Ronan O’Rahilly, who gave it his personal seal of approval.